But What’s the End Game? 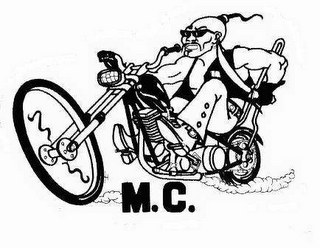 The U.S. government has been in a multi-year, multi-indictment quest to acquire the trademarks of the Mongols motorcycle club. You can find the whole complicated background here, but the short version is that, because of improper assignments, the government indicted the wrong party the first time around. 33. 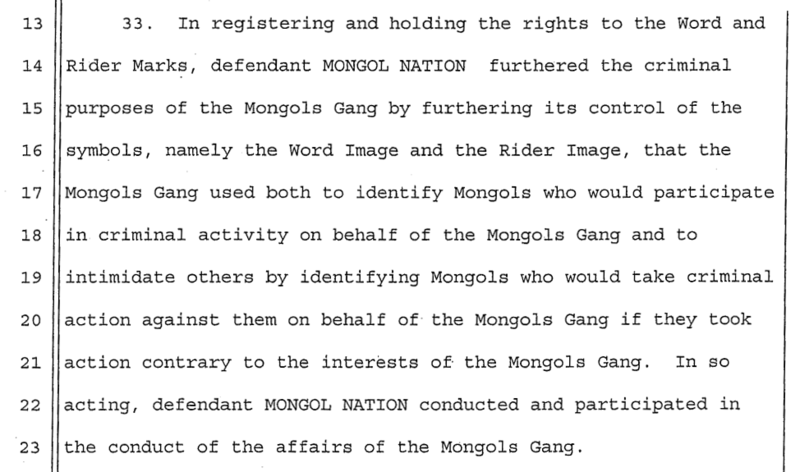 In registering and holding the rights to the Word and Rider Marks, defendant MONGOL NATION furthered the criminal purposes of the Mongols Gang by furthering its control of the symbols, namely the Word Image and Rider Image, that the Mongols Gang used both to identify Mongols who would participate in criminal activity on behalf of the Mongols Gang and to intimidate others by identifying Mongols who would take criminal action against them on behalf of the Mongols Gang if they took action contrary to the interest of the Mongols Gang. In so acting, defendant MONGOL NATION conducted and participated in the conduct of the affairs of the Mongol Gang. The indictment called for forfeiture of the word and design marks “that, at one time, [were] registered with the USPTO ….” The indictment mentions by number only the original trademark registrations that are now dead, replaced with two new registrations the government doesn’t mention by number. a pretrial motion to dismiss is not the appropriate time to determine the viability of a potential forfeiture of property after a potential conviction of Defendant Mongol Nation. Defendant has not provided any legal support for the proposition that dismissal of the Indictment or striking the request is the appropriate remedy for a flawed criminal forfeiture allegation. Further, there are many possible outcomes in the course of trial, conviction, and enforcement of any potential forfeiture, such that any adjudication of the constitutional issues would essentially constitute an advisory opinion. But it had greater success on the fundamental RICO theory, because it take two to have racketeering. Mongol Nation and the Mongol Gang weren’t legally distinct enough and so the indictment was dismissed. But what’s the end game here? The government has spent years trying to gain control of the Mongols trademarks but suppose it eventually does – then what? It doesn’t seem like an asset that the government can monetize. The MUSTANG RANCH trademark was seized for tax fraud and eventually successfully auctioned off, but that was a legal business. And seizing a trademark will hardly stop members of the Mongols from continuing to wear it – is the theory that by making the apparel they will be counterfeiters of the government-owned trademark? I just don’t get what the government hopes to accomplish by seizing the trademarks. U.S. v. Mongol Nation, No. CR 13-0106-DOC (Sept. 16, 2015).